Division is denoted by the divide sign, ÷. 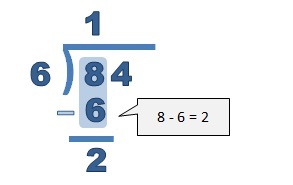 The method used to divide numbers will differ depending on the difficulty of the division. Dividing short numbers is easier than dividing long numbers together. It is relatively easy to divide short numbers. Children may learn division by sharing out objects into equal groups and counting the number in each group. 4 numbers had to be counted, so 12 divided by 3 is 4. 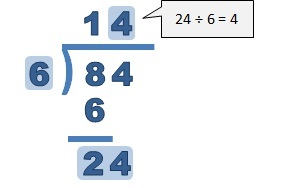 Long division is used to divide longer numbers. Question: What is 84 ÷ 6? Identify the dividend and the divisor. Multiply the answer from the previous operation with the divisor. Write the result underneath the number divided into. Bring down the next digit of the dividend (4). There are no more digits to bring down, and 6 divided into 24 exactly, with no remainder. The number you divide is the dividend. The number you divide by is the divisor. The result of the division is the quotient. Division is the opposite, or inverse, of multiplication. If two factors multiply to a product, then the product divides by one factor to the other factor. Division doesn't always work out perfectly. Numbers do not always divide into equal groups. 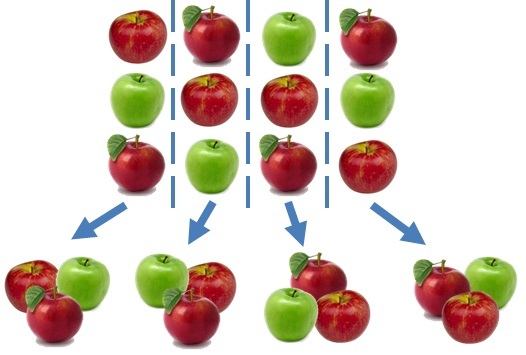 Looking above, it can be seen that it is not possible to split the apples into 2 equal groups. The answer to 7 ÷ 2 is 3 (as there are 3 apples in each group) remainder 1 (there is 1 apple left over). The r stands for remainder. 3 is the whole number answer (which is asked for in the long division to the left), and 1 is the remainder. Round the number down: 3 is the whole number answer. Multiply the whole number answer by the divisor. Subtract this this from the dividend. 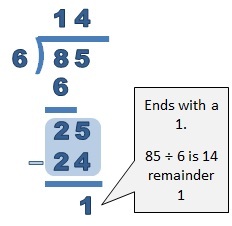 In the long division done on the left, there is no remainder - 6 goes into 84 exactly 14 times. 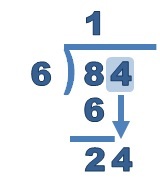 This can be seen in the last step, when 6 divided into 24 exactly, with no remainder. Because a 1 is left after the final subtraction, after all digits of the dividend, the remainder is 1. 85 ÷ 6 = 14 r 1.